Salmon with Capers, Thyme for Cooking easy gourmet dinner. Nothing says spring like the first appearance of green garlic. I buy as much as I can, as often as I can. It's season is fleeting here, 3 or 4 weeks. If you are a garlic lover I hope you can find it. Substitutions are given. Lemon and capers combine to add lots of flavor to this simple preparation. Quickly seared, they can finish cooking over low heat while you enjoy your starter. Slice lemon, 4 - 6 slices, remove pips. Turn skin side down. 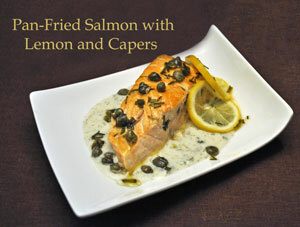 Lay the sliced lemon on top of the salmon and sprinkle with capers and chives. When done, using a spatula, slide the filets off of the skin. To serve: Spoon some Dill Sauce on each plate or a small platter. Spoon capers and lemon slices on salmon. In a small saucepan over medium heat bring wine and stock to a boil. Mix cornstarch in water and stir into simmering stock. Cook until slightly thickened. 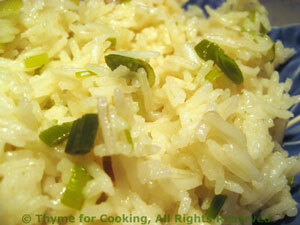 Remove from heat and stir in herbs and yogurt. Cover and keep warm until serving. Asparagus is one of the long awaited signs of spring. 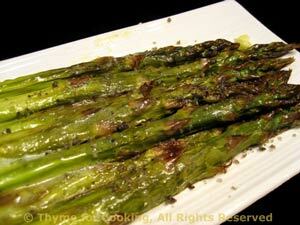 Most often steamed, occasionally roasted or grilled, I have discovered simple frying to be quick, and leave the asparagus a beautiful green color and full of flavor. Snap off ends of asparagus. If white use vegetable peeler and peel the bottom half of stalk. Put asparagus into a skillet big enough to hold them without cutting, add butter, oil and sauté over medium heat until starting to brown and blister, 8 - 10 minutes. Sprinkle with lots of pepper, salt, remove and serve.